As the next election approaches, look forward to months of painful smears, scare-campaigns and subtly racist dog-whistling as the Coalition look to rescue their teetering Government from the abyss. TO PARAPHRASE Annie Lennox, here comes the pain again. The pain from the endless smears and scare-campaigns, and subtly racist dog-whistling as the Coalition look to rescue their teetering Government from the abyss before the next election. After 28 consecutive Newspoll losses, a resurgence seems a distant hope, yet they won’t go quietly, but rather kicking and screaming, and biting and scratching. Yes, it’s going to be painful. 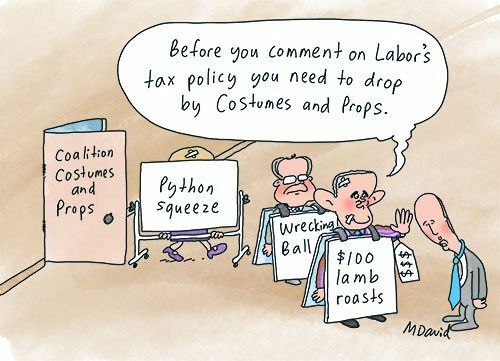 It will be painful to watch Treasurer Scott Morrison – a man who sounds like he’s swallowed a talking machine turned to top speed – blather himself into a lather attacking Bill Shorten whilst occasionally touching briefly on topics within his portfolio. We’ve watched this movie before. At the last election, when Morrison, a former shill for the Property Council of Australia, declared Labor’s modest changes to capital gains tax provisions would put a “sledgehammer” into the property market and bring the economy to a “shuddering halt”. It later emerged that his own department regarded this as complete nonsense, but he was undeterred. Although it doesn’t show, Morrison has a degree in economics — but then again, so does Tony Abbott. Morrison’s latest frothy-mouthed foray involves attacking Labor’s new plan to remove a tax lurk set up by Peter Costello in 2001. Basically, it involves people being able to claim a tax refund on franked dividends even if they didn’t pay any tax. When combined with Costello’s later rort ‒ in 2006, removing retirees from needing to pay any tax on superannuation fund withdrawals ‒ it meant a large number of wealthy retirees were getting money back through the tax system without having ever actually paid any tax. It is costing the Government billions every year. The man who brought in compulsory superannuation and franking credits, Paul Keating, supports the changes, saying the system was never meant to work this way. That the changes by Costello during the Howard Government were designed to advantage the Coalition’s affluent base. Morrison has a different take, of course. “Bill Shorten is reaching his hand into [pensioners’] pockets and ripping out the cash, ” he said today on morning television, in his usual colourful way. The policy will affect around 200,000 part-pensioners and about 14,000 full pensioners, according to Labor’s figures — much less than 10 per cent of the total number of aged pensioners in Australia (2.4 million in 2013). Yes, there will be some pain for them, although you should never base your financial future on a tax lurk that is likely to be closed at any time. In truth, Costello’s 2006 piece of shifty dealing should also be closed — and hopefully at some stage in the future it will be. It is also painful to watch the corporate media predictably slam the plan today as a “tax grab”, “revenue grab” and “class war”. Cutting off tax refunds to people who didn’t pay any tax to begin with can hardly be described as a “tax grab” — it is just common sense. The bottom line in all this is that the same people who try to claw back fictitious debts from impoverished welfare recipients want to give big business a big tax cut and maintain a system that pays billions of dollars of taxpayers’ money to wealthy people who don’t pay any tax — and that’s not fair. Gillespie seemed to soften his stance somewhat in later interviews ‒ not wanting to be seen as racist, perhaps ‒ but the whistle had been heard loud and clear; the hares were off and running. Channel Seven’s execrable morning show, Sunrise, duly ran a segment in which a white host discussed with two white commentators whether “white families” should be allowed to adopt abused black children. Both of the commentators were in furious agreement they should and to hell with “political correctness” and talk about “stolen generations”. "Don't worry about the people that would cry and handwring and say this would be another Stolen Generation. Just like the first Stolen Generation where a lot of people were taken because it was for their wellbeing... we need to do it again, perhaps." All this, of course, caused immense pain to many Indigenous Australians. It was exactly once month ago on Tuesday that we marked the tenth anniversary of the Apology to the Stolen Generation. Just a coincidence? In any case, it is mind-boggling that White Australia could be so insensitive as to start advocating a new Stolen Generation so soon. … the idea that Aboriginal children are not being placed in white families is a lie. The kinship and Aboriginal child placement principals in many states and territories recognise the need for Aboriginal children to be kept in communities, or in extended families. But often, in practice, this principal has fallen far short of its aims. A parliamentary inquiry into out-of-home care in 2015 heard that it can often come down to the whim of an individual child protection worker, and that the idea of placing a child with a non-Indigenous carer is not often a “last resort”. The greater lie is that Aboriginal children are not being taken away and are being kept in dangerous situations for fear of a “stolen generation”. That does not gel with the statistics: Aboriginal children are being taken away at exponential rates and these rates have grown every year since Kevin Rudd gave his apology to the Stolen Generations and promised it would “never happen again”. This is only half the story! The rest of this editorial, originally published as part of the Independent Australia weekly subscribers' newsletter, may be read in the IA members only area. It takes less a minute to subscribe to IA and costs as little as $5 a month, or $50 a year — a tiny sum for quality journalism and many great extras!